Tonight is the first game of the season for Arizona State University. We are playing Northern Arizona so we better win this game. Football fans everywhere are filled with hopes and promise that this year will be a winning season. ASU should have a good year and I am so excited that it's football season again. Okay, my excitement really has to do with with more than just the game of football. My favorite part is the tailgate parties. We have several great friends that we meet up with and bring food and drink to share. 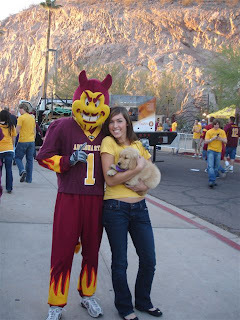 ASU tailgate people are a little crazy as the temperature is often 100 degrees and there is no breeze! Every year we discuss putting misters on our tent and talk about getting an AC fan, but never really get around to purchasing them. But we are okay because the beer is cold and the wine is good and the food is delicious. 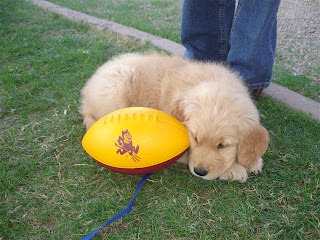 Last year, we brought our golden retriever, Wrigley, into the family during football season and were not comfortable leaving him for so long. So, we decided to bring him to the tailgate party and I stayed out with him and listened to the game on the radio. He was a very popular with the students and other tailgaters! I think our husbands enjoyed the female students who flocked around this adorable, tiny puppy! He enjoyed stealing a hot dog from a child in the group next to us. I loved watching my children and our puppy play together. My daughter took Wrigley up for a picture with the team's mascot, Sparky. I do not know if we will be bringing Wrigley along to the tailgate parties this year, seeing that he now weighs 80 pounds. But this will be one memory I'll remember for a long time. AWwwwww... Wrigeley was so cute as a puppy...!! !